In 2015, during the annual Facebook F8 developer conference, the social networking giant unveiled plans for the messenger platform aimed at making it a standalone app. Facebook made the platform accessible to users away out of Facebook through Messenger.com in addition to making it possible for users to sign up to the platform via their mobile phone number in addition to their Facebook account. There were also plans to use the platform as a CRM tool. Facebook announced a partnership with with two shopping sites for the service. The two sites were able to send receipts and shipping updates via Messenger. Since then, the Messenger platform has amassed 800 million active users and has added interesting functionalities including voice calling, Businesses on Messenger, sending money, Messenger platform for apps, sharing location, Photo Magic, Facebook M digital assistant and the recent Uber integration. The 2016 of the Facebook F8 developer confrence kicks off today, where we expect a raft of new measures to be announced. 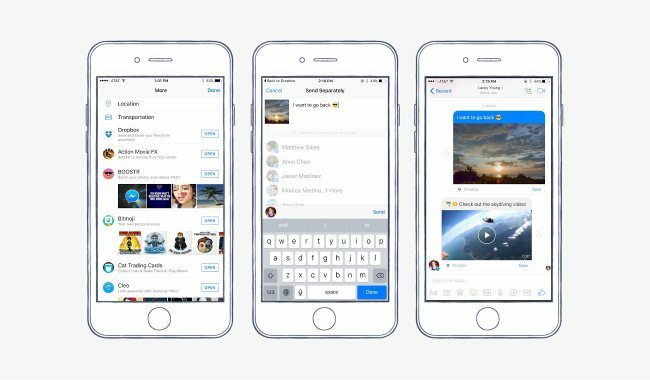 Dropbox has announced that it is integrating its platform to Facebook messenger allowing users to share photos, videos, and other files in Facebook Messenger. This functionality will be available via the More button in Messenger for iOS or Android where users will see Dropbox as an available source. With the Dropbox app installed on the user’s phone, they can share any file from Dropbox without having to leave the Messenger app. Videos and images including animated GIFs will be displayed in the messenger app while tapping other files to open ushers the Dropbox mobile app to preview and save files.